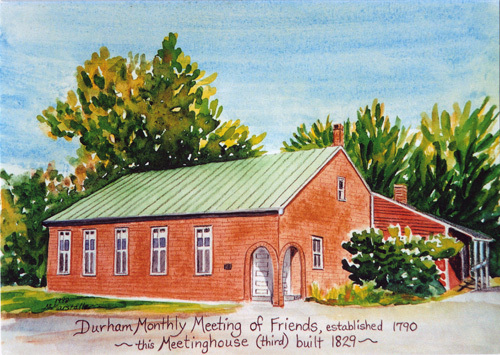 Durham Monthly Meeting of Friends convened in worship for the conduct of business on Sunday, November 18, 2018 with 15 people present. Clerk, Susan Rice, opened the meeting by reading from the Pendle Hill Pamphlet #453 by Elizabeth Meyer: A Practical Mysticism. The minutes of October 21st were approved. Newsletter Committee: Liana Thompson Knight reported that the deadline for news for the Newsletter has changed to 5:00 pm on the Wednesday after Monthly Meeting. Committee reports are to be sent to Jo-an as well as to the Recording Clerk. Persons submitting information about upcoming events should write up a blurb for the Newsletter. The Newsletter Committee is open to run articles written by Friends on topics with which they are engaged. Due to difficulty with the meeting copier, the Newsletter will be copied at Staples. They will need an adjusted line item in the budget for this purpose. Currently the phone tree is for those who do not have email. They ask persons who have information for a Durham Friends Note call David Dexter who initiates the phone tree. David will have a summer landline number that should be used in the summer months. Those who do have email but would like to receive a call will be invited to opt-in to the phone tree, and thus might call others as a part of the phone tree. Ministry and counsel: Martha Hinshaw Sheldon reported that they are reviewing, overseeing, and praying for pastoral care issues and worship experiences in the meeting. A concern was raised about disruptions in worship occurring when the doors are opened multiple times throughout worship. M&C encourages folks entering during worship be mindful of how often they open and close doors for various reasons. Jo-an Jacobus has offered to facilitate a Christmas Eve worship service at the meetinghouse in the same manner as last year. We greatly appreciate this opportunity. In January, M & C plans to outline themes to be used by those responsible for Care of Worship and bring messages which will be from New England Yearly Meeting Faith and Practice and from the yearly meeting annual focus. This year the theme – “In Fear and Trembling, Be Bold in God’s Service” – asked us to be bold in a broken world. A small group of Friends (Edwin Hinshaw, Nancy Marstaller, and Nat Shed) volunteered to meet with Ralph and Twila Greene, and listen to their concerns. They explored options and possibilities, and discussed workable solutions for the Greene’s housing needs. Durham Friends may contact Ed and Nancy for further information. Appreciation was expressed for Ministry and Counsel’s on-going concern for the meeting. We approved the following minute: Janet Douglas, a long-time member of Durham Friends Meeting and mother of member and former pastor, James Douglas, passed away on September 10, 2018. A memorial service was held in the meetinghouse to celebrate her life on November 10th with her family and members of the meeting present. Janet was well loved and appreciated for what she taught those who knew her through her life work. Finance Committee: Sarah Sprogell presented a preliminary 2019 budget for the meeting. Some committees have requested an increase in their line item. The final budget will be brought to the December monthly meeting for approval. We expressed gratitude for their careful work. Christian Education Committee and Youth Minister: Wendy Schlotterbeck reported that the Halloween Party was held October 26th at the Meetinghouse. The children enjoyed an outside “in the dark” scavenger hunt with prizes, a piñata, bobbing for apples and donuts on a string with a lovely spread of food. It was attended by 26 people, including 9 children. At Game Night, November 3rd, they enjoyed a hefty potluck and several hours of games, conversation and laughter. They will have the annual Wreath Making Party on Sunday, December 2nd after a potluck meal following worship. Materials will be provided, but live greens of any kind are welcome! The Christmas Program will be on Saturday, December 15, gathering for worship and a turkey dinner. Come at 4:00 to help prepare the meal and set up. Worship, sharing of poems, songs or personal stories will be at 5:30 with dinner to follow. The committee welcomes Ashley Marstaller as our new Child Care Provider. She started November 11th and will continue to provide loving care every Sunday from 10:15am – 12:15pm. It was suggested that she remain on duty for another hour or so to facilitate the attendance of parents to monthly meeting on monthly meeting Sunday, if she is able to extend her time. We expressed appreciation for the ongoing work of this committee and the Youth Minister. We approved the proposal that the Child Care Provider, Ashley Marstaller, extend her time on monthly meeting Sunday until 1:30 pm if possible. Peace and Social Concerns Committee: Ingrid Chalufour reported that there were 10 persons who attended the showing of the film, It’s Criminal on November 16th. A meaningful discussion was led by Paul Miller. Trustees: Margaret Wentworth reported that Kim Bolshaw, a regular attender who lives near the meetinghouse, has been hired as Custodian. We are thankful that Kim is willing to do this work. Ad Hoc Working group: Joyce Gibson reported for this “committee.” Their final report was presented concerning strengthening Durham Friends Meeting regarding pastoral care, coordination, and outreach. They noted that we are a meeting in transition and reminded us that Ministry and Counsel is responsible for pastoral care, and coordination is under the care of the Clerks Committee. They recommend that the Newsletter Committee become a Communication Committee. They noted that outreach is everyone’s responsibility. An alternative approach would be to establish an Outreach Committee, and/or a part time position devoted to outreach. They recommend revision of the Meeting Handbook to be fresh and accurate reflecting changes in the meeting. Included in their report is a summary of Ministry and Counsel’s approach to pastoral care. Their full report is attached to these minutes. It was recommended that the Clerks’ Committee become a standing committee and take on continued discussion of these concerns. They believe the Ad Hoc “committee” has done the job that the meeting assigned to it and therefore requested that the Ad Hoc Working Group should be laid down. We approved the Newsletter Committee be renamed the Communication Committee and that it include the website and other similar activities. We approved that the Clerks’ Committee be a standing committee to meet regularly at least every other month. We approved revising and updating the Durham Monthly Meeting of Friends Handbook. We approved laying down the Ad Hoc Working Group and expressed much appreciation for their work. We closed with a period of silence.